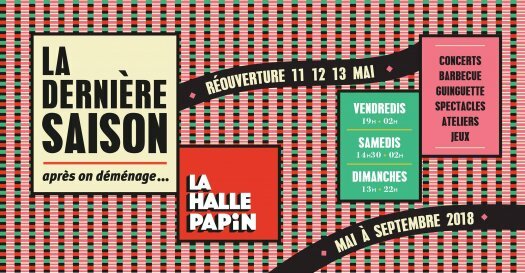 As part of temporary installations in Est Ensemble, the Collective Soukmachines company is staying for a whole year at the Halle Papin in Paris Pantin. The 2,300 m2 of this old factory left unattended for many years will be occupied temporarily by groups of artists before renovation work of La halle. To celebrate the opening of La Halle, a special animated party by Soukmachines took place on 18th June 2016 from 2:30pm to 2am. The programme : a temporary moving Bar, barbecue, family workshops, concerts, etc. Since then, the group organizes regular events at this industrial wasteland close to Paris: On Saturdays we are at the Halle or Les Bouffes Mondaines. Halle Papin housed, from the 20's, the company Jeumont-Schneider, traction and signage equipment suppliers for, among others, SNCF and RATP. Then, companies from the automobile industry settled here. La halle was unoccupied for several years. The town of Pantin has a rich industrial heritage: the Grands moulins which now houses the new BNP. La manufacture Louis is another example.